Hempnall Mill Rd towermill was a 4 storey towermill that was built in 1814 in an adjacent field to the existing postmill and eventually took over the whole business. 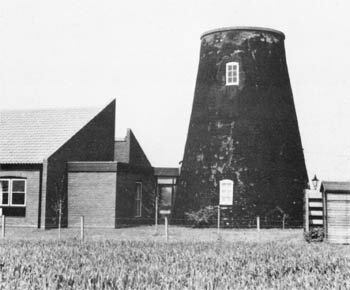 The mill was built by James Carver under a 150 year lease dated 26th May 1814 granted to him by The Trustees of the Inhabitants for the time being of the Town of Hempnall at a ground rent of £3 per annum. He was granted the land to build One brick Tower Wind Mill of a proper and sufficient size and dimension ... with all its requisite going gears and appertenances fit for grinding corn and grain. He was also to ensure the mill was properly maintained. At the end of the lease, the owner was to take the mill down and remove it in order to leave the land in a fit state for cultivation. The mill was originally designed to draw trefoil seeds as well as grind wheat to flour. The seeds stones were almost certainly taken from the postmill and installed into the more powerful towermill. However, by 1833 the pair of seed stones had been replaced by a second pair of Fench burr stones. The 25 foot tower with 2ft 3in thick walls, had two doors on the ground floor and held a boat shaped cap with a petticoat and a 6 bladed, left handed fan. The mill was powered by four double shuttered sails, the outer pair having 8 bays of 3 shutters and the inner pair having 7 bays of 3 shutters and 1 bay of 2 shutters. The sails were struck by rack & pinion via a chain pole. drove a pair of seed stones and a pair of French burr stones. A flour mill and jumper were also in use. James Carver snr mortgaged the leasehold mill complex and land to Thomas White, a local farmer from Shotesham for £200. In December 1828 they both assigned equal shares of the remainder of the lease to James Carver's other son, Thomas Carver and a David Irwin, both men being printers working in Norwich. They in turn took out a mortgage from Robert Youngs of Lakenham for £200 in January 1829. N.B. Any order for J. C. left with his Son at the Golden Ball, Castle Ditches, Norwich, will be punctually attended to. A newly erected BRICK TOWER WINDMILL, four floors, with a pair of new French Stones & a pair of SEED Stones & Going Gears complete. Also a large POST_MILL with two pair of French Stones & Flour Mill & all going gears complete. This mill may be had separate if wanted to remove. The above are in adjoining fields & are situated in Hempnall, near Long Stratton, an excellent corn country & well situated for trade being nine miles from Norwich, eight from Bungay & seven from Harleston..
Enquire of James Carver, the proprietor, Hempnall or the auctioneer. Last Sunday afternoon during a violent gale of wind from the W.N.W. 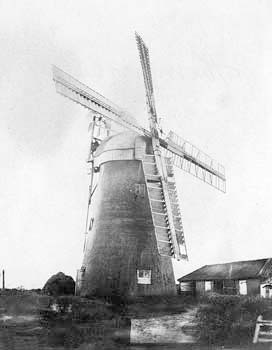 approaching almost a hurricane, a windmill at Bungay was blown down, and two others, one at Hempnall and another at Sprowston lost their caps and sails. A Substantial Brick TOWER WINDMILL now in Full Trade with two pair of French Stones, Flour mill & Jumper, the whole in a Complete & excellent state of Repair, together with 2 acres of Land attached. The above is eligibly situate at Hempnall near Long Stratton & is a Desirable Situation for any Person who has a Small Capital at Command. The Purchaser or Tenant may be accommodated with a comfortable House & a few Acres of Land adjoining the Mill if required at a moderate rent. Apply to Mr. Warmoll on the Premises or at the Office of this Paper. 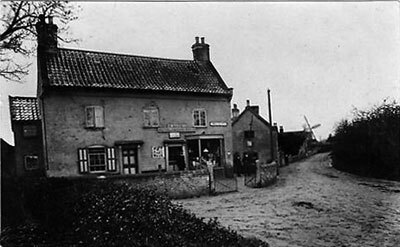 On 1st February 1834 John Thirkettle, a Hempnall farmer, bought the mill for £255 with the mortgage being paid off within the price. He then took out a new mortgage for £200 from Susanna Forster, a widow from Thetford. In November 1859, Thomas Parker, miller at Topcroft_postmill, agreed to buy the mill for £230 and in October 1860, with the mill already in his occupation, the property was assigned to him by the Trustees of John Thirkettle, who had died some 20 years earlier on 19th March 1840. Thomas Parker took out mortgages totalling £250 in 1861 and 1863 from John Hotson of Stratton St Mary. In 1863, due to ill health, Thomas Parker was working the mill in conjunction with Walter Henry Hylton of Hempnall_Green_smockmill. However, by October 1864, Thomas Parker had defaulted on mortgage repayments and John Hotson had repossessed the mill. A TOWER WINDMILL drives two pair of stones, patent sails, now in the occupation of Mr. Glasspool. Apply to Messrs. Spelman, Norwich. A TOWER WINDMILL with Patent Sails, drives two pair of Stones, patent sails, late in the occupation of Mr. Glasspool. For particulars apply to Messrs. Spelmans, Norwich. Wm. 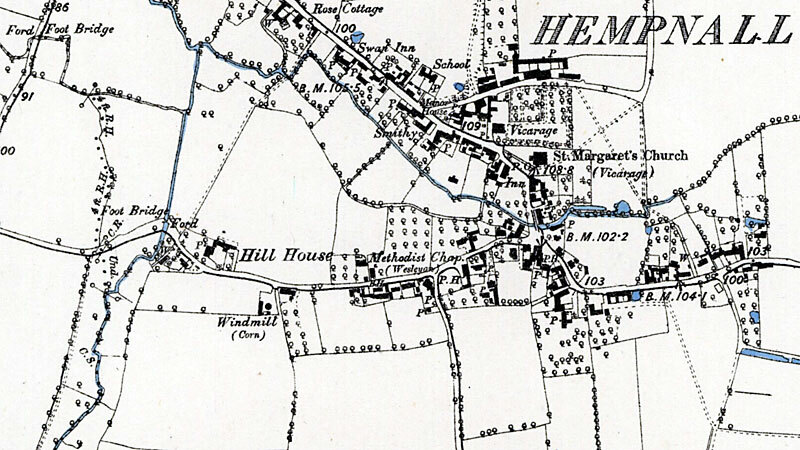 Spelman & Sons have received instructions to sell by Auction during early part of June the windmill occupied by Mr. James Beckenham, several Houses with gardens & a valuable piece of arable land situate in Hempnall. Lot 4. 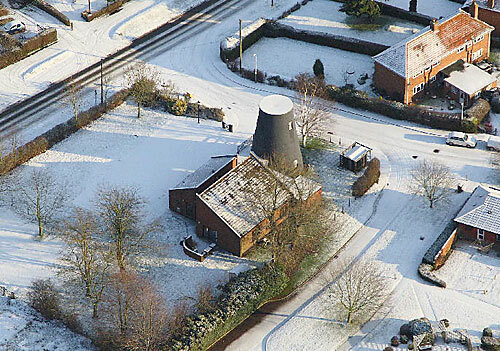 A Brick TOWER WINDMILL situate in Mill Street with land adjoining containing altogether 2a.1r.0p. The Mill winds herself, has patent sails, drives 2 pairs of French stones, flour mill, jumper etc. Particulars of Mr. S.H. Asker, Solr. Norwich & of the Auctioneers Norwich & Yarmouth. A TOWER WINDMILL with Patent Sails, winds herself, driving two pair of French Stones, Flour Mill etc. with Dwelling house, Garden etc. Apply at Post Office, Hempnall. A Brick Tower WIND MILL in Hempnall, Norfolk. For Rent & Particulars apply to Mr. Read, Bricklayer, Hempnall, who will show the Mill or to Mr. Asker, Solicitor, Norwich. 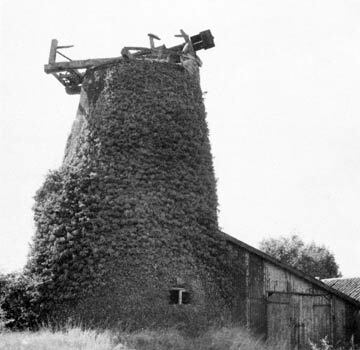 A TOWER WINDMILL in full trade, driving two pair of French Burr Stones, with Flour Mill & Jumper. Patent Sails. Valuation moderate. Immediate Possession if required. Mill & Land at Hempnall, Norfolk. 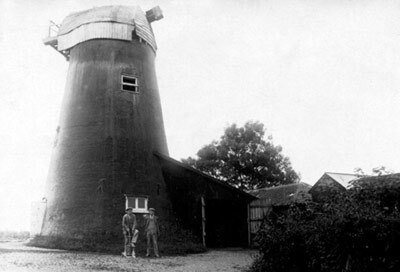 A Capital TOWER WINDMILL, Stables & Granary with about 3½ acres in the occupation of Mr. Thomas Parker & Mr. Hylton. Apply to Messrs. Hotson & Furness, Solrs. Long Stratton. To be SOLD or LET with Immediate Possession, a capital TOWER WINDMILL, Stable & Granary, with about 2½ acres of Land, late in the occupation of Mr. Thomas Parker & Mr. W. H. Hylton, near the street. WANTED a steady active Single Man as JOURNEYMAN MILLER. Apply James Buck, Hempnall, Long Stratton. Robert Borrett is instructed to Sell by Auction on 3 September 1889 at the Nelson Inn, Hempnall at 6 for 7 o’c in the Evening, the following Desirable PROPERTIES in two Lots, viz. Lot 1. All that Leasehold Self Winding Brick Tower WINDMILL with Patent Sails, having 4 floors & driving 2 pairs of Stones. Also a Brick & Tiled Granary, Cartshed & Stables & an Inclosure of capital accommodation arable LAND adjoining, the whole containing 2a. 1r. 30p. as now in the occupation of Mr. Henry Buck. Possession at Michaelmas next. Lot 2. Freehold LAND adjoining Lot 1 & the above mentioned Public Road call Mill Street. Particulars from Messrs. Copeman & Cadge of Loddon, near Norwich the Vendor’s Solicitors or from the Auctioneer’s, Pulham Market, near Harleston. A capital self-winding Brick Tower WINDMILL driving 2 pairs of French Burr Stones. Also brick & tiled Granary, Cart shed & 2 Stables with two lean-to Sheds in the Mill Yard. 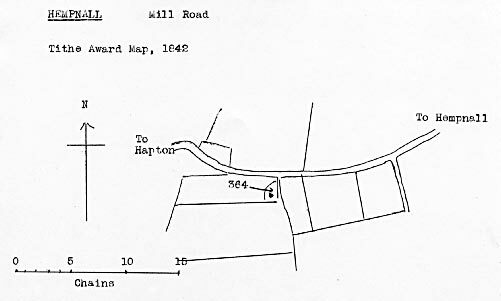 Also an Inclosure of Arable Land adjoining the Mill yard, the whole containing 2a. 1r. 30p. The property is conveniently situated for trade in the street & is in the occupation of Mr. Frederick Seaman & possession with be given at Michaelmas next. Further Particulars from the Auctioneer, Pulham Market near Harleston or from the Vendor’s Solicitors, Messrs. Copeman & Cadge, Loddon near Norwich. There is an interesting bill announcing the forthcoming auction of the mill. On Tuesday, July 19th, 1892, at the “Safety Valve”, Forncett, at 4 to 5 o’clock in the afternoon. A Capital self-winding BRICK TOWER WIND MILL. Having four floors & tiled granary, cart shed & two stables with 2 lean-to sheds in the Mill yard. Also an enclosure of capital accommodation arable land adjoining the Mill yard, the whole containing 2a. 1r. 30p. The property is conveniently situated by the side of the Mill Street, in the Populous Village of Hempnall. The property is held under a lease from the Feoffes of Hempnall Town Lands for a term of which 72 years are unexpired. Mill in occupation of Frederick Seaman. John Hotson's widow Eleanor Hotson was the sole executrix of his estate and had been unable to sell the mill by auction on more than one occasion. In April 1898 she succeeeded in selling the mill to the sitting tenant miller, Henry Hart for £100. In March 1900 he assigned the lease to Arthur Salter, from Fritton for £230 thereby obtaining a healthy profit. The initial agreement of 13th March 1900 also included the portable steam engine. In April 1900, Arthur Salter charged his deeds to Barclay & Co., bankers in Harleston. However, by May 1901 he was forced to make a Deed of Assignment for the benefit of his creditors and the bank put the mill up for sale by auction in the same month, although it remained unsold until July 1904. Walter William Vout, miller at Hardwick_postmill, bought the mill in July 1904 and it was being worked by Henry Vout later that year. In 1915, Arthur Aldridge of Shotesham_watermill bought the mill at auction and it was sold again by Eliza Aldridge in June 1919 for £300 to Miss Helen Kate Vout. Walter William Vout was born in 1874 at Salhouse and married Hannah Maria Dann who was born at Fritton, in the last quarter of 1895. Their daughter Helen Kate Vout was born in 1897 at Hardwick. Having four Floors, fitted with Patent Sails & driving two Pairs of French Burr Stones, two Stables, Harness room, & Engine house, together with an Enclosure of Arable LAND, the whole containing 2a. 1r. 30p. & in the occupation of Mr. A. Salter. Particulars of the Auctioneers, Queen Street, Norwich & of Geo. Sillem, Esq., Long Stratton, Vendors’ Solicitor. Including Bay Cob, two Miller’s Carts on Iron Arms, two sets of Harness, Iron Water Cart, Hand Chaff Engine, Grindstone. Driving Belt, Iron Tank, 3 Sack Barrows, Flour Scales & Weights, Scale & 22 Weights, Mill Bills, Ladders, about 12 Coomb of Corn & Meal & a Small Quantity of Beet & Straw, which will be sold after the Mill. Particulars of the Auctioneer, Queen Street, Norwich. Equitable Mortgage by way of Memorandum of Deposit of Deeds to cover overdraft. Vout’s Mill at Hempnall was not what I call a good mill. Not what I would call a good mill like “Gooseberry” Muskett’s Mill up Field_Lane. This was by far better both externally & internally, probably it was much younger. I dismantled both of them. I can faintly remember the one on the Greens near “The Horseshoes”. This was also a Tower Mill but not brick. It was weatherboarded as was the one at Bedingham. The millwright mentioned was Cecil Thompson of Hardwick_mill. He first worked at Cringleford_water_mill. In 1909 he was at Topcroft. Later Tasburgh, then Hardwick. He also worked as a millwright at Ditchingham, Hempnall, Wicklewood, Billingford, Caston & Wymondham. Cecil Thompson died in 1970 aged 84. Kelly's of 1922 lists Miss Helen Kate Vont as the miller, but by 1925 she was listed as Mrs.Helen Kate Hannen having married Robert Stanley Hannen, who was listed as miller in 1929. Helen Kate's maiden name was in fact Vout and she was the daughter of Walter William Vout, who also owned mills at Ditchingham and Hardwick. In September 1930, Helen Kate Hannen sold the mill to George Wellesly Bristow for £420. It is likely that he died around this time as Kelly's of 1933 and 1937 only list Mrs. M. A. Bristow as the miller. 1. When my father, Mr. Bristow, came to Hempnall to live at the Mill House opposite the Chapel the Mill was owned by Mr. W. Vout of Starston. Later on my father and my eldest brother bought the Mill. I was very young at the time and I do not recollect how many years they owned the Mill. 2. According to weather the Mill was worked either by wind or oil engine, therefore, the amount of corn grinded in one day varied, meaning if the wind was gale force, the results of flour meal, etc., were much higher in quantity than when an ordinary windy day or engine drives which was a steady process. 3. The Farmers brought their harvest yieldings in corn sacks to the mill either to be sold to the miller for sale, or to be ground into flour or wheat meal (Barley into Barley meal), (Oats into Crushed Oats), (Maize into Kositos) etc. On the premises there was a granary where slabs of cattle cake, the size of them was one yard long by half yard wide also Lugese beans which were very sweet, we found out, also bran and supers were kept in the building all food for cattle. 4. The method of corn grinding was a sack of corn was fastened to a steel chain round the small neck of sack which sometimes was wheat for flour weighing 18st. and it was very difficult to fix chain correctly and when I pulled the rope to hoist it up to top floor it would nearly get as far as the first trap door when the chain would come off and down came the sack of wheat and more often than not being so heavy the sack would bust and I had to stand clear. My father would come down and I knew he was not very happy about it all. When all went well and the corn was hoisted to top floor it was lowered in shutes and passed through very large wooded bins, through the grinding stones which were very large and round, about 1 ½ yards in diameter and when in working order the pair would go in opposite direction of each other. When through working after a weeks grinding they would have to be dressed every Thursday by my father and brother by chisel and hammer making them rough again after wearing too smooth, and special eye glasses had to be used for the work it was a full days work, as the dressing had to be perfect. We spent most of our childhood playing around the mill when home from school and would often climb the stairs inside there to reach the top, had to climb a tiny ladder to stand on the platform outside to view Hempnall which was great fun, ear to the Fly wheel the small wheel from this there were two very strong steel chains outside the mill and two 56lb weights were hung on them at the bottom to support and balance when very windy. The Sails were made of canvas vanes. After the corn was grinded of various kinds my father would deliver by horse and cart assisted by such barrow to different farms miles around and it was a treat for us to be allowed to go with him sitting on sack of corn in the cart and enjoying it all. A question of how many cogs? All I knew there were hundreds inside the mill and also in the revolving part of top of mill, which were the actual workings of the mill, when going at full force the noise inside was almost deafening although we got used to it all. My father was a skilled miller having had his training with his uncle in Burnley. It was said that Mrs. M. A. Bristow had a mill manager by the name of Lockwood. ... Hempnall a derelict tower, a second mill having gone altogether. Cecil Thompson, miller at Hardwick was also a millwright and he dismantled the wind machinery c.1939. Iron windshaft. 14 ft. 6 ins. long neck diameter 14 ins. Mounting for brakewheel 14 ins. square. Great Spur Wheel. 8 ft. 3 ins. diameter. All wood clasp arm on 20 in. square fitting on 16 sided wooden Upright Shaft 12 ins. diameter. Originally 105 cogs. Portion of wheel with 8 cogs rotted away. 2 pairs underdriven French Burr Stones, 4 ft. diameter including one runner stone 4 ft. 3 ins. 2 all wood stone nuts, 22 cogs, on spindles, one of which with iron crown wheel. 1 pair 4 ft. French Burr Stones. 2 Stone Nuts with spindles, one with iron crown wheel. Other small items of salvaged iron work. On 9th December 1978, the Hempnall Mill Centre for Day Care held an informal open day prior to opening on 12th December that year. The Centre was the result of a joint project between the Norfolk Social Services Department and the Trustees of the 400 year old Hempnall Town Estate Poor Charity and was designed by Norfolk's assistant architect. The mill tower was converted to form a cosy sitting room. A historic moment in the life of the elderly of Hempnal has at last arrived and the ‘Mill’ will be opening for the first time on Tuesday, 12th December. You will, no doubt, appreciate that this is a very new venture for all concerned and we shall be beginning on a very experimental basis. Tuesday and Friday. Handicapped Care under the auspices of the Norfolk County Council Social Services Department. Wednesday Mornings. 10 am – 12.30. For elderly Hempnall men. Newspapers, magazines, dominoes, cards etc., will be available, and coffee will be served. This will be in the Tower Room. Fortnightly The Happy Circle Club. If there is a demand a ladies afternoon could possibly be arranged on the alternate Wednesday afternoon. Thursday 10am - 4 pm. Open Day for any elderly person whoLives in Hempnall. Lunches will be served on Thursdays and in limited number on Tuesday and Friday. Coffee will be served in the morning and tea in the afternoon. Tea and coffee will cost 3p. Lunches will cost 37p. All meals must be booked in advance by 10am on the day required. They can be booked by telephoning the centre between 10 and 4 on opening days. If you require transport, either to be brought in for the whole day on Thursday, or just for lunch, please ring the centre or Mrs. B. Sutton. The Hostess on Thursdays will be Mrs. Beryl Sutton, the Long House. The Telephone number of the Mill will be published as soon as it is available. Mr. R. Ladbrooke, the Deals, Mill Road. Hempnall 446 Chairman. Dr. S. Griffiths, Hill House, Hempnall. Secretary. Mrs. B. Sutton, The Long House Hempnall 360. Mr. L. Chapman, Green Boughs, Mill Rd. Hempnall 514. Mrs. B. Wilson, The Post Office Hempnall 201. The Revd. C. Bradbury, Morningthorpe Rectory, Long Stratton 30225. Mr. A. Brewington, Thatsit, Mill Road, Hempnall. Mr. P. Alexander, The Hall, Hardwick, Long Stratton 30379. Mr. H. Watson, Seebohm House, Queens Road, Norwich 29053. County Hall wants to refocus its day services for people with dementia and re-ablement needs, while it would commission independent and voluntary organisations to provide day services for frail elderly people. But that would signal the closure of the popular Essex Rooms and Silver Rooms in Norwich, while two social services days at Hempnall Mill in South Norfolk would also be stopped. September 1930: Helen Kate Hannen sold the mill to George Wellesly Bristow for £420.